Article for the UOL Bulletin. Fall, 2008. Orthodoxy possesses the fullness of the Truth. It provides the sure way to peace, hope, and salvation. It restores our relationship with God and one another. The solution to every real problem is found within our Sacraments. So why aren’t our churches full? Why are entire generations of baptized Ukrainian Orthodox “missing in action”? And why aren’t the spiritually impoverished and under-churched people in our neighborhoods filling our pews to receive the Body of Christ and drink from the Fountain of Immortality? The recent Pew Study on Religion found that Orthodox parishes lose one out of every four of those Baptized into their ranks. The overall number of Orthodox remains constant, but only because there are enough converts (through marriage or otherwise) to make up for the loss. While I am happy that we are attracting so many converts, these data suggest three major problems. First, gains and losses are not evenly distributed and there are many parishes that lose far more people than they gain. Second, the survey sample is truncated so that it does not even address the funeral to baptism imbalance. Third, even if a parish manages to “break even” in terms of parishioners, it has still lost one out of every four of its own children to heresy. The Truth is too important for us to do so poorly. While I think that the most important way to address parish decline is to improve our commitment to the Truth, Beauty, and Authority of Orthodoxy,* this must be augmented by evangelism: the wedding banquets tables are set, but the hall is empty: it is time for us to make sure everyone gets an invitation (paraphrase of St. Matthew 22: 8-10). In the Parable of the Wedding Feast (St. Matthew 22: 1-14), the king sent his servants into the highways and hedges to find guests; we can augment this by going out onto the “information superhighway” of the internet and associated technologies. The most obvious (and simplest) way to let people know that that your parish possesses and desires to share the Fullness of the Truth with them is with a welcoming and informative website. At a minimum, it should have a brief statement of faith and legitimacy, contact information, pictures, service times, and links; but what will set it apart and gain credibility for your parish (especially among our lost generations of 20 – 40 year olds) is personalized content. This can mean anything from more pictures to posting bulletins, homilies and articles. Outside information (delivered via links, applets, or even “cut and paste”) is fine, but does not have the same effect as locally-generated content (think “facebook” rather than “yahoo”). One warning: expand your website gradually – nothing looks worse that a website whose content is out of date. 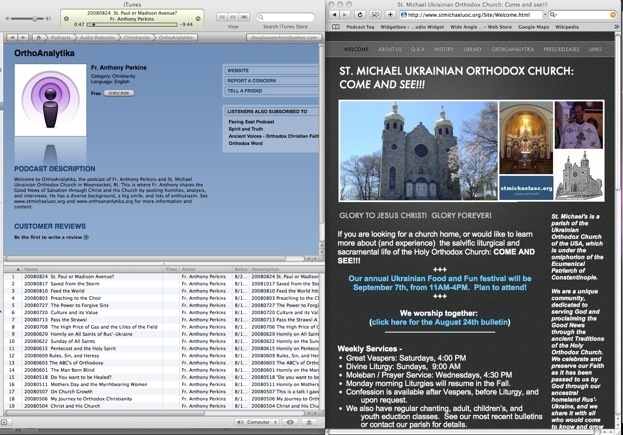 It takes our webmaster about 5-10 hours a week to solicit, generate, and publish material to our website (www.stmichaeluoc.org). The next step: blogging and podcasting. Two more ways to share content and reach out to people in your local community (and the world) is through blogging (i.e. keeping an on-line journal) and podcasting (kind of like producing a regular short radio program). Blogging is the easiest: you can set up your own blog at www.blogspot.com in a manner of minutes. Your priest is used to writing, so encourage him (and give him time!) to regularly post his thoughts and reflections. Be sure to provide a link to the blog from your website (see our parish website, www.orthoanalytika.org and orthoanalytika.blogspot.com for three examples of how this can be done). Podcasting takes more time, but if you digitally record your priest’s sermons, it is simply a matter of prettying it up making it available on the internet. It took us a couple of weeks to crack the code, but our podcasts are now available both on our website and via iTunes (search for “Orthoanalytika”). While anyone with internet access can subscribe to your blog and podcast, subscriptions usually spread by word of mouth through your community (which mirrors the primary mechanism of church growth). We personalize our podcast by adding recordings of parish musicians. One more possibility: on-line communities. While YMMV, I have found it useful to keep active profiles on both Facebook and OrthodoxCircle. I daresay that most of our Jr UOL members (and those who should be… which is everyone in the world of the right age!) has a Facebook account, and using your own account makes it easy to stay in touch with them (the presence of a few priests also helps lend an air of civility/sanctity to a medium that sometimes threatens to break out into unaccountable hedonism). Each of our parishes possesses the complete fullness of the Truth that people long for. Share it with them and invite them to the feast. * Here is the short of improving our witness of Orthodoxy: focus on the Gospel of Salvation, Peace, and Life in Abundance through Christ and His Church (Witness to Orthodoxy’s Truth); offer the services in all their splendor through enthusiastic and proficient singing and chanting, well-maintained icons, vestments, and facilities, and having everyone radiate the joy of our Risen Lord (Witness to Orthodoxy’s Beauty); and love your priests and bishops, support their ministries, and demonstrate reverence, respect, and submission to their offices (Witness to Orthodoxy’s Authority).